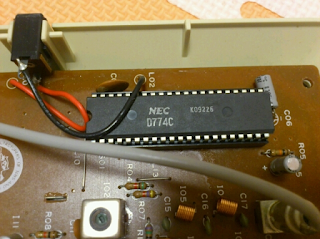 A few hour ago, i sent to plgDavid the pinouts of the NEC uPD774C (among other information) so that the M.E.S.S. 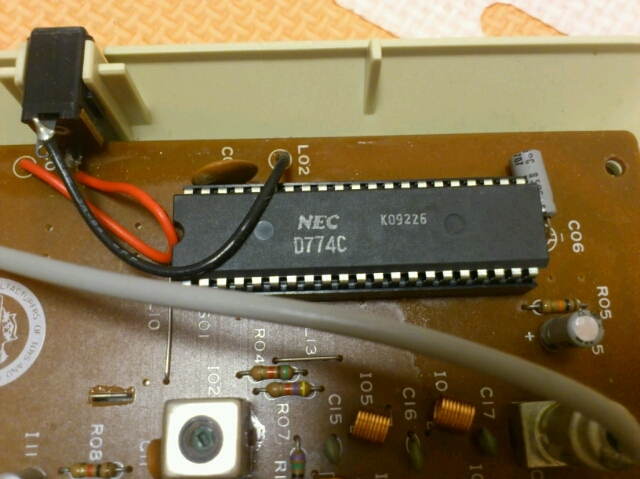 team could try to dump and emulate this chip, and also other NEC dedicated game chips found in Epoch Cassette Vision cartridges. 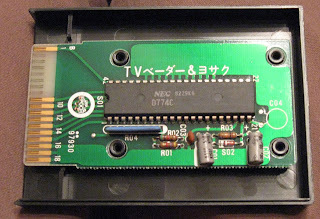 The uPD774C is found in the Battle Vader cartridge for the Epoch Cassette Vision (and Jr) and the Epoch TV Vader game console. For now, i only retrace an Epoch TV Vader. They are many pins not connected (almost 50%) and i haven't tried those on an oscilloscope to see what's they are doing (or not). The chip called the C626C, done also by NEC, is an 18-pins TV Video Modulator which takes some outputs of the D774C and modulates it with an RF output to either Channel 1 or 2. Since the C626C is like the LM1889, you could convert with ease to an Audio/CompositeVideo output (Sound is pin #19) or even S-Video (Y and C or Luma and Chroma) or if you dare try but the result would be awesome (yup...big pixels on screen...not the movie mind you...lol!) 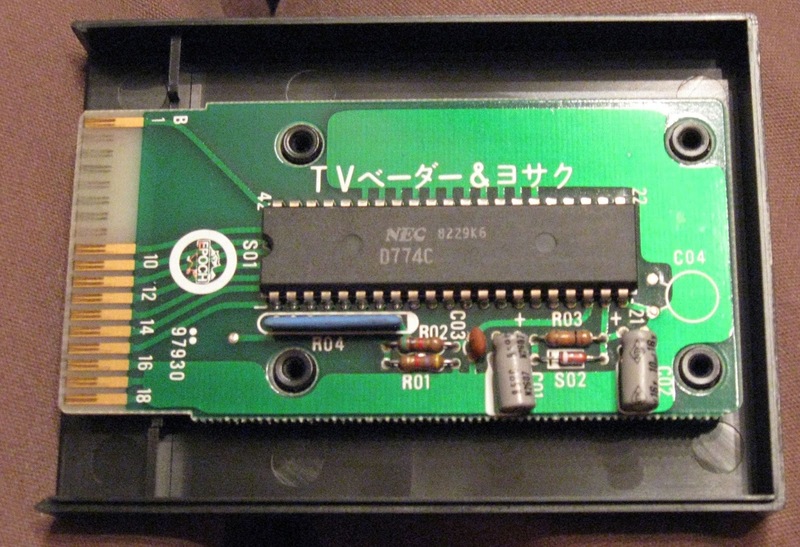 is to output to R-Y, B-Y and Chroma+Luma (aka Component Video) but you would need to amplify those outputs because those signals are too weak to be displayed. I haven't checked all the other Epoch Cassette Vision cartridges i have (i'm only missing #11 and 12) if the pinouts would match or not. 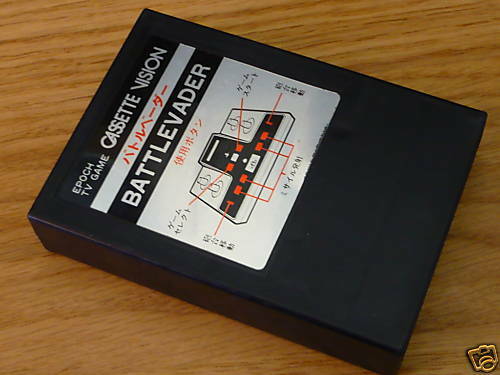 At least, this is a step in the right direction for future emulation. UPDATE: Since i was missing two pins to be identified, that was bugging me so i decided after i posted this, to finish the pinouts and i'm very glad that i did because i completely screwed-up the pinouts by inverting them (42 was 1 and so forth). 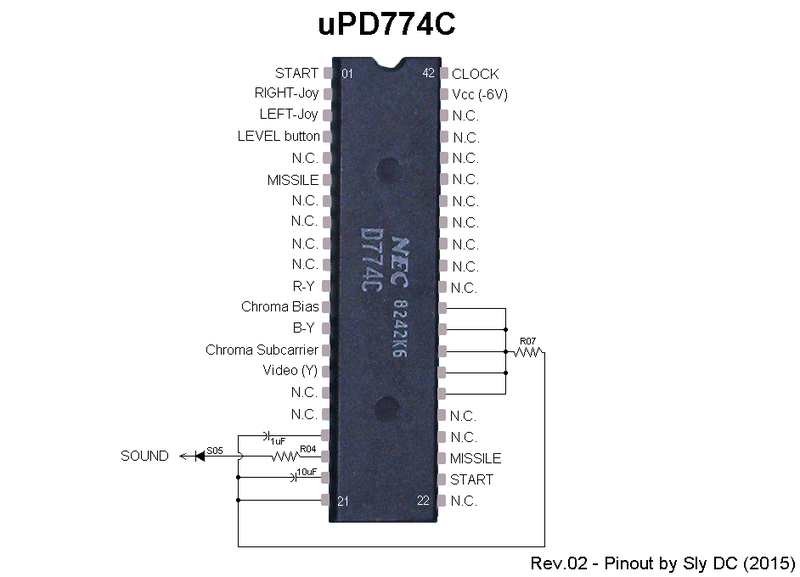 So this is the correct pinouts of the D774C with also the missing sound pin, and if you need the CLOCK frequency, it is 3,58MHz. Now i need to send this to plgDavid pronto! Can these tv aders be fixed? I have two but only one turns on nd its a glitchy mess. Hi and sorry for the very late reply. The TV Vader consoles can be repaired but if the dedicated chip (D774C) is broken or damaged, then you will need another chip which can be found in any Battle Vader cartridge.